PHILADELPHIA, PA – March 22, 2018 – Janney Montgomery Scott LLC (“Janney”), a leading full-service wealth management, financial services, and investment banking firm headquartered in Philadelphia, PA, is pleased to announce that five of the Firm’s Financial Advisors have been honored by Financial Times in its 2018 list of the “Top 400 Financial Advisers.” The advisors named from Janney include Murray Carter of Washington, DC; Stephen Goldstein and Richard Keetley of Baltimore, MD; Charles Noble of New Haven, CT; and Peter Sargent of Newtown, PA and Raleigh, NC. Murray Carter serves as Executive Vice President/Wealth Management and is a founder of CSG Capital Partners of Janney Montgomery Scott. He has over two decades of experience in the financial services industry and has achieved the advanced designations of Certified Financial Planner™ (CFP®), Accredited Wealth Management AdvisorSM, Accredited Investment FiduciaryTM, and Certified 401(k) Professional. Mr. Carter was included in the Financial Times “Top 401(k) Plan Advisers” list in 2017 and 2015. He and his team were also recognized by The National Association of Plan Advisors (NAPA) as a Top Defined Contribution (DC) Advisor Team in 2018. Stephen Goldstein is Senior Vice President/Wealth Management of Scheinker Investment Partners of Janney Montgomery Scott. He is a Certified Financial Planner™ (CFP®) with the Accredited Investment Fiduciary™ (AIF®) designation. Mr. Goldstein specializes in financial planning for high net worth clients through a family office approach. Other areas of expertise include portfolio management for individuals and foundations, retirement income for retirees, and multi-generational wealth planning for high net worth families. He received his bachelor’s degree in Business Management from the University of Maryland as well as a Master’s of Finance (MSF) degree from Loyola College in Baltimore, Maryland. Mr. Keetley began his career in 1992 at Legg Mason where he was Director of Investment Management Services and focused on Financial Planning and Professional Money Management for high net worth clients of the firm. Since joining Janney, he has been named as one of two Advisors on the Firm’s Wealth Management Mutual Fund Investment Committee. Mr. Keetley is a member of The Investment Management Consultants Association and is a former Board Member with St. Ambrose Housing and Aid Center where he has served on the charities board and finance committees. He received his B.A. in Social and Behavioral Sciences from Johns Hopkins University. Charles J. Noble, III serves as Executive Vice President/Wealth Management of Noble Wealth Advisors of Janney Montgomery Scott and Branch Manager of the Firm’s Downtown New Haven, Connecticut office. His financial career spans over 30 years. This is the fourth time that Mr. Noble has been named a “Top 400 Financial Adviser” by Financial Times, with previous recognition in the 2013, 2014, and 2017 rankings. 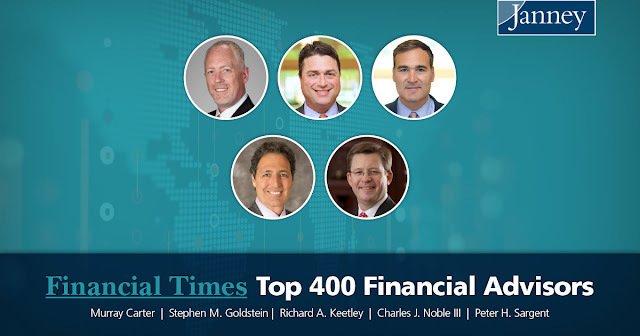 In 2018, he was recognized for the fifth consecutive year as a Top Advisor by Barron’s, which ranked him among the top advisors in Connecticut. He was also honored as Janney’s “Financial Advisor of the Year” in 2012. Mr. Noble is currently a member of Janney’s Board of Managers and serves on the Board of Directors of Ecochlor, Inc. He received his B.S. in Finance from the University of New Haven and completed the SIA Course of Study at the Wharton School of Business. Mr. Sargent is a member of the New York Society of Security Analysts, a member of the University of Delaware Financial Planning and Wealth Management Advisory Board, and was a former Board Member of the Alumni Association at the University of Delaware’s Business School. He received his B.S. in Economics from the University of Delaware.